This page describes the remote start system in the same way as it should be described in the rules. The start module is a non profit development which is open source and open hardware. Every round is started by the referee sending a start signal with an IR transmitter. As soon as the robot receives the signal the round will start. (This method makes the matches fairer since it eliminates false starts and is also time saving since less restarts is needed). The contestant can choose to either implement all the hardware and software by them self or he/she can simply use a prebuilt module (recommended). The kill switch is used to cut power to the motors of the robot, which is used as a security precaution and is only mandatory in the 3kg class. When the referee sends the stop command the power to the motors has to be cut. 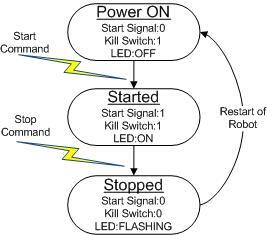 The robot builder is responsible for adding such a kill switch on the robot by themselves, however the prebuilt module can supply the signal for activating the kill switch. Examples of recommended design can be found below. The prebuilt module takes care of all communication and is very easy to implement. The robot only needs to wait for the start pin on the module to go high and then it should start. The module accepts supply voltage (VCC) 3.3-5V. The connectors have standard 2.54mm pitch. The figure below illustrates the modes of operation of the module. To be less sensitive to noise and disturbances the module will save its current state into a non-volatile memory and if it is resets it will return to the last known state. This means that each match will end with the referee sending the stop command. Note: If the LED on the module is on before the referee has sent the start command it means that the module is in the “Started” state. Then the stop command has to be sent and the robot needs to restart for the module to go back to the “Power ON” state. To be able to run multiple matches next to each other each dohyo will have its own unique identifier. The prebuilt module can be re-programmed to listen for a new identifier. This is done by the referee by sending a special programming command which updates this identifier. Robots which use sensors that are based on IR technology with a 38kHz transmitter modulation are encouraged to start their sensors after the start signal is received. This is to minimize the risk of disturbance. Visit the link below where it is described how the system is intended to be used during competition, make sure to read it before the competiton. How to implement Kill switch circuit using a relay. How to implement Kill switch circuit using an optocoupler. So where can I buy this? How much? And is there any code library or listing for use in Arduino kits? Usually, these are sold for competitions. You can check which competitions use them under Used by. The price vary depending on the competition. Somewhere between around 10-15€ a piece. It you use the prebuilt module, you only need to read a single input pin, which really doesn’t need a separate Arduino library. HELLO THERE IM JORGE FROM MEXICO WE PLANING TO USE THE REMOTE IN A COMPETITION DOWN IN MEXICO CAN YOU TELL ME PLAESE WHEN IS GONNA BE THE NEXT BATCH ORDER …I NEED ABIUT 200 MODULES AND 3 REMOTES….